On 11th April 2019, Hammersmith bridge, opened in 1887, was closed indefinitely as engineers found cracks in the structure that have raised serious safety issues. 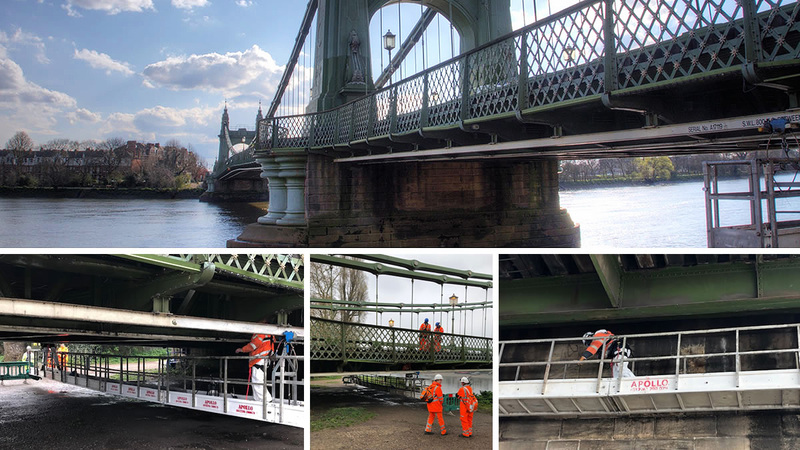 Prior to this decision, Clearway were called-in to provide specialist cleaning services to remove years of caked-on, hardened pigeon guano (droppings), to enable engineers to assess the bridge’s structure. The cleaning process was both difficult and dangerous, requiring operators to work from a cradle using specialist equipment to remove the guano, whilst a boat on the river below was positioned to collect the waste, preventing it from falling into the river. The entire operation was complex and extensive, taking 10 days to complete. Hammersmith bridge is the weakest of all the bridges that span the Thames and it operates under severe weight restrictions because it was never designed to bear the volume or weight of modern vehicles. Current restrictions allow only one bus in each direction at any one time. This ongoing situation has finally led to substantial improvement works being implemented and the cracks found in the structure have left the Council with no option other than to close the bridge indefinitely pending further investigation. The bridge remains open to pedestrians and cyclists. When a retail park-size store closes-down it immediately presents an opportunity for the premises to be illegally occupied and even for the property to be squatted. Not only does this carry the stress of arranging court enforcement eviction for squatters but also the high cost associated with the damage and mess and health risks left by fly-tipping, vandalism and drug paraphernalia. This exact situation recently occurred in one of the now-closed Toys ‘R’ Us stores in Croydon, Surrey. The site was quickly occupied by multiple unsightly caravans within days of the closure and the aerial photo shows the extent of waste and fly-tipping whilst they were still there! The subsequent damage to the site and the cost of clearance could all have been avoided if security measures had been put in place immediately after the site was vacated. As soon as the illegal occupants were evicted it was imperative to secure the site before a recurrence. Clearway were immediately instructed and began with clearing tons of fly-tipped waste, leaving it clean and tidy for any potential viewings. We secured the perimeter with multiple concrete barriers; a powerful way of preventing unauthorised vehicle access to the site and preventing further trespassers, fly tippers, vandals and squatters. We also secured the property using steel security sheets and a Clearway keyless Toreadoor which effectively controls access to the property by allowing only authorised personnel in and out using unique codes. Whilst empty retail units are the sad face of economic difficulties, once cleared and secured, they at least present somewhat less of an eyesore until they can be occupied by new business owners. Japanese knotweed is one of the most invasive and destructive plants in the UK. The extremely aggressive plant can grow up to four inches a day in the summer and the plant’s roots can spread so far underground finding its way into existing cracks in concrete, pathways and walls or it finds its way into basements, causing structural damage to buildings. The map provided by Environet pinpoints thousands of infestations across the country. The worst areas have been located in outer London, Merseyside, Lancashire, Bristol, Newport, Swansea, Nottingham and Sheffield, as they are home to high volumes of the weed. As experts in treating Japanese knotweed we recommend it being treated during early and late Summer with the dead stems (above ground growth) removed in the Winter. However, standard advice is to treat Japanese knotweed as soon as it is identified. Clearway’s teams are qualified and accredited to use undiluted industrial strength Glyphosate. This is injected directly into each stem (stem injection) for larger plants and sprayed onto smaller plants (foliage spray). If spraying is not suitable for a given area we are also able to provide removal by excavation. In August 2018, the DIY chain, Homebase, announced it was closing 42 stores across the country by the Spring of 2019 and that a further 70 stores were under on-going review pending negotiations with the stores’ landlords. Homebase stores are invariably on retail parks and their out-of-town centre sites makes keeping the vacant buildings secure a challenge, given the often deserted locations. Vacant buildings on this scale are a target for breaking and entering, vandalism and theft, and the car parks act like a magnet for anti-social behaviour and other criminal activity. As soon as the Canterbury store closed its doors Clearway was called in to secure the entire site as it was deemed to be in a high-risk area where criminal damage and arson had been reported in October 2018. There was particular concern that this empty store would attract squatters or be an easy target for illegal fly-tipping. Clearway went into action straight away and steel screens were fitted to provide a robust and secure exterior to all windows with steel access doors installed so that estate agents could still carry out viewings for potential new tenants. They also allow access for Clearway’s property inspectors to regularly check the premises both inside and out for any maintenance work needed to stop any deterioration of the building fabric and fittings. Finally, securing the perimeter of the large car park was paramount to preventing trespassers, squatters and other illegal occupation by vehicles. The solution was to install 33 interconnected concrete blocks around the perimeter with a security access gate to allow authorised entry. The site remains secure but is, sadly, likely to be only one of many as a further 17 Homebase stores are scheduled to close with 32 still under negotiation. Being a keyholder is a pain. You always seem to be called out at the most inconvenient time but someone has to control out of hours entry and access to or within buildings, or when a property is otherwise vacant and needs to be kept secure. Of course there’s nothing like a good, solid security door and there are wooden doors, there are barred doors, reinforces doors, metal doors and all manner of security locks… but they generally require keys or a physical presence of specified or recognisable people to open them. Steel keyless doors, on the other hand, are another matter, but not all are the same. The Clearway Toreadoor is designed, manufactured and tested to the rigorous Loss Prevention Standard LPS1175, giving it insurance approval. The SBD (Secure by Design) accreditation is a UK Police preferred specification which supports the principles of ‘designing out crime’ to reduce the risk of crime through design excellence. The Toreadoor is a unique and gold standard system which provides a total sense of security for those responsible for the protection of a building or simple to restrict access to certain areas. Imagine how useful a door would be if… It was keyless and therefore prevented all unauthorised access It can’t be removed by cutting-off the hinges The door is reinforced stainless steel with a unique five-point independent locking mechanisms Its multi-level pin code access is standard via a built-in keypad You can programme your own entry codes The build-in twin battery system provides unique fail-safe operation allowing for more than 150,000 door operations up to 9 years Its manual internal mechanism allows for easy/rapid exit in emergencies- you can never be locked-in Single use access codes are available for emergency services and unexpected visitors The automatic locking and slam-lock system keeps the door locked at all times Does this sound too good to be true? Well, it’s not. Is it what all keyholders have been praying for? Absolutely. If you think it could work for your organisation or facility, and make your life easier, get a Toreadoor – exclusively designed and manufactured by Clearway. Clearway’s Toreadoor is the preferred choice of Local Authorities, the NHS and other public and private sector organisations as well as a property management companies, facilities and security managers, not only for its many operational benefits, but also because it was the first and still is the only keyless security door approved by the Police. Taken from the Spanish word ‘Toreador’, literally “to fight a bull”, the Clearway Keyless Toreadoor incorporates a range of security features simply not available on any other product. Call us today and see how our security solutions can help you. Have you been watching the latest series of #Luther? And last week it was reported there were 132 murders in London in 2018, a 10 year high, and the City overtook New York for the first time in the number of homicides. There was a 12% rise across the UK (excluding the London and Manchester terror attacks) and about 150 unidentified bodies are discovered every year. Does the TV or these stats make you think about how the police often have to deal with difficult crime and trauma scenes? These can include murder, suicide, undiscovered deaths, accidents and terrorism… which usually leave behind blood, body fluids and tissue, chemicals and infestations from maggots and flies; not to mention dangerous items such as weapons or drug-related gear are frequently left at the scene to also clear. These scenes can be quite gruesome and gory. Specialists skills and knowledge are required for this type of work which is why Clearway has held the Crime Scene Security & Specialist Cleaning contract for the Metropolitan Police since 2009. Our teams are constantly faced with many different challenges, not just the remains of dead bodies! With warnings that the coldest winter on record is approaching, and temperatures are set to plummet as icy winds head over from Scandinavia bringing snow, heavy rain and sleet to the UK, the Met Office, via Twitter, is advising the UK to be “weather ready”. Even occupied buildings need insulated pipes to continue providing heat and hot water but what about your vacant properties? If pipes freeze they can leak or even burst which causes havoc in the depths of winter. It’s essential to ensure your vacant properties are fully drained-down and the water supply is isolated. Our Property Pack solution is an all-in-one service for utility isolation, drain-down and property inspections – all essential services for vacant properties. Abiding by the law, complying with regulations and following the highest professional standards of working practice… and belonging to the accredited trade and professional bodies and associations who expect all this from their members, may sound dull and boring bureaucracy. It may also seem irrelevant to some in today’s entrepreneurial and fast moving business culture but, to many people, it’s what differentiates a first class, reliable, ethical and responsible organisation from the ‘cowboy’ operators, or ‘here today, gone tomorrow’ outfits who may seem like a cheap deal but who cut corners and aren’t concerned with important issues such as the health and safety of either their own staff or their clients’ staff and customers. This is particularly true when it comes to the management and security of vacant property. Vacant property can often be a problem to manage and health and safety is a critical consideration when ensuring it is kept secure from unauthorised intruders, anti-social and criminal behaviour, especially since the property owner is legally liable for any mishaps that might befall trespassers as well as official visitors. However, it’s not just about keeping people out; securing the outside of the property is just as important as the menace of fly-tipping is a growing scourge on our streets and industrial estates as well as in open countryside. The waste is often unsafe, containing needles or potentially harmful substances, and dealing with it should be carried out under the strictly controlled Hazardous Waste Regulations, hence the need to use experienced specialists. Far better to secure your site in the first place to stop this unauthorised dumping; concrete blocks, steel barriers or bollards are easily installed. Clearway takes pride in being fully accredited security specialists with the right solution for whatever needs arranging for their many and varied clients nationwide, and unlike many of their competitors, they are members of the British Security Industry Association (BSIA). In fact, they are so highly thought of that one of their senior managers chairs the Vacant Property Section of the BSIA. The BSIA campaigns on behalf of its members for better standards across the Industry and tighter regulations and laws to support their efforts to keep all of us safe. In fact, take a look at their latest opinion piece in this month’s Fire and Security Matters http://www.fsmatters.com/fly-tipping-security-bsia. It reiterates everything we have commented on above about the importance of consulting the experts and letting them sort out your site security. A commercial estate in Oxfordshire was hit by thieves on more than one occasion and a lot of valuable IT equipment was taken. Despite having made previous visits we were confident the intruders would come back again so, rather than just deter the thieves, the owner wanted to catch them in the act. The Clearway inView CCTV Tower was the perfect solution with infrared lighting and low-light camera capability. Positioned near the building, facing the entrance to the site, the scene was set to catch the thieves red-handed. The plan worked perfectly as two individuals were detected entering the site in darkness. They were immediately detected and reported by the monitoring station to the authorities. A response unit was dispatched within 25 minutes, the individuals were detained and subsequently arrested by the Police. It’ll be Lights! Camera! Action! Tonight as Clearway works directly with Bluewater Shopping Centre, in Kent this evening for their annual Christmas lights & fireworks display, which is due to attract a large crowd. The Clearway mobile CCTV unit will be in operation from the start of the event at 5pm to help with public safety, traffic management and crowd control. Fitted with a powerful pan/tilt/zoom camera mounted on a 6m adjustable mast, and multiple fixed cameras, the mobile CCTV unit a highly effective visual deterrent with its striking graphics. Clearway will also be providing other security services in the coming months for Bluewater Shopping Centre such as fixed CCTV for the Christmas grotto and ice skating rink. The worst Halloween party of all time might be happening in your empty property, and you’re not invited. If you think an impromptu Halloween rave in an empty property is scary, imagine the damage squatters, vandals and thieves will do! According to Aviva, “Halloween is the worst day of the year for vandalism with claims for malicious damage to homes soaring by 160%.” Unsecured properties are frequently vandalised, flooded or fire-damaged, leaving the owner responsible for hefty cleanup and repair bills. Halloween is upon us, the spooks are coming out. It’s time to sort out your empty property. Curious children tend to wander onto derelict building sites unaware of the dangers that could face them. In 2017, there were two very sad cases of children dying as a result of playing in buildings that were left unprotected. The responsibility for protecting the public against the potential risks of a vacant property lies entirely with the property owner. In fact it’s a requirement of their insurance to protect the building against any visitors, be they property inspectors, developers, fly-tippers or squatters. The biggest risk is to children as vacant properties and sites are such attractive places to explore. Clearway specialises in full building protection; physical perimeter and electronic security, steel security, concrete barriers and CCTV. Toys R Us closed its doors early in 2018 following a challenging period on the high street, leaving a number of large, prominently placed retail units in town and city locations across the UK. With large store footprints including loading bays and extensive car parking, the primary security concern was preventing vandalism, illegal occupation and fly tipping. Clearway provided a solution to secure the properties using keyless steel security doors to allow simple controlled access for viewings, property inspections and maintenance. We fitted tailored steel security screens to protect the large glazed shopfronts from vandalism and to deter intruders. Access to the sites was secured with concrete barriers placed across entrances and vulnerable perimeters. The former Toy R Us sites represent a significant opportunity to retailers, hence maintaining the fabric of the buildings, whilst providing the highest level of security, was a key concern. With extremely large aluminium framed windows our specialist teams overcame the challenge by building bespoke frames that were tied-in to the fabric of the building, thereby minimising the impact of securing the steel screens with security screws, whilst maintaining a robust perimeter to the building. Over a single night in August, thieves hit an industrial site in Livingston, Scotland, forcing entry and stealing a vast amount of high-value metal equipment, such as I-beams, tower bracing bars and anti-climb equipment, valued at around £300,000. A Detective from Livingston CID said: “We believe whoever was responsible for this theft will look to sell the metal on for scrap and as such would require either one large vehicle, or a number of vehicles.” CCTV would very likely have been a highly effective preventative against the theft but none was present and it seems there were no witnesses or anyone recalling any suspicious activity. The Clearway CCTV Tower incorporates a camera at the top of a 6m mast and is designed to work 24/7 in vulnerable, open-space areas, whether or not mains power is available. The tower is remote operated and, in its own right, acts as an excellent visual deterrent. Metal theft continues to be a major issue across the UK with common targets including beer kegs, manhole covers, catalytic converters, air conditioning units, copper wiring and cabling, lead from roofs and bronze plaques and statues. Britain has seen 28,000 pubs close since the 1970s, with more closures forecast as business rates rise. Between Jan and June 2018 pubs are still closing at the rate of 18 per week. Anti-social behaviour in the form of squatters and vandals is a major problem in the towns and communities affected by pubs closing down as they are continually broken-into, often to be used as drug-dens. The hardest hit areas are in the North West and South East of England, which each saw a staggering 61 pubs close in the first six months of 2018; an increase of 13 compared to the last six months of 2017. Clearway provides a nationwide rapid-response support service for some of the largest pub companies in the UK including Greene King, Enterprise and Admiral, providing a full range of property security, guarding and CCTV services. Illegal fly-tipping remains a major issue for councils and private land-owners across the UK, and those responsible will go to any lengths to dispose of their unwanted rubbish and waste material, despite the risk of being caught on CCTV. Recently a CCTV installation company in West Yorkshire captured, on their own CCTV security system, clear footage of fly tippers, including the vehicle registration and the identities of those involved, as they off-loaded waste material, mattresses, foam and bedding parts on the road. In the video footage the driver is seen edging the vehicle forward to allow more and more waste to be dumped onto the road. Ironically, the camera that caught these fly-tippers was hidden, suggesting the perpetrators were avoiding all the cameras they could see. This highlights the point that having CCTV cameras on full view is, in itself, a highly effective deterrent. It is frustrating that as the land is privately owned, there is little the authorities can do, but the company posted the camera footage on social media and this has prompted the council to investigate further. Our parent company, The Clearway Group, is pleased to announce the acquisition of Cerberus Security. We are delighted to welcome them as the newest member of the group. Monitoring from a former ex MOD secret nuclear bunker, Cerberus Security operates one of the UK’s few NSI Gold Category ll Alarm Receiving Centres, providing professional 24/7 monitoring of CCTV, alarm and fire systems. Cerberus’ monitoring already protects more than £60m in fixed and transient assets across the UK. This, combined with manned and canine guarding services which puts Cerberus in the top 5% of SIA contractors, brings enormous benefit to Clearway customers by widening the range of services available. With around 180,000 visitors, the Great Yarmouth Air Show presented the perfect opportunity to showcase Clearway’s mobile CCTV unit to remotely monitor crowds. The mobile unit was delivered to Norse Security’s head office on the 15th June where the staff were trained by Clearway on how to operate the cameras and mast as security staff would need to be able to move and monitor the pan-tilt-zoom camera from inside the van or remotely via mobile phone. Norse security setup and tested the unit on-site with the mast fully extended and tested all cameras to ensure they were fully operational and ready for the weekend. The van was put to work from 2pm Friday to 9am Monday, with all cameras recording 24/7, proving the unit is self-sufficient and power-independent, running from batteries and solar panels. Working directly with ResponSec, the Clearway mobile CCTV unit provided a temporary security solution for the Junction 2 festival 9th June. The mobile CCTV unit is highly effective as a visual deterrent for anti-social behaviour and was located at the festival’s main entrance providing the perfect solution to information gathering for the security team on public safety, traffic management and crowd control. Fitted with a powerful pan/tilt/zoom camera mounted on a 6m adjustable mast, the whole main entrance could be monitored by the security team. The mobile CCTV unit can be located anywhere as it is self-sufficient and power-independent so is ideal for use at events and where remote monitoring is required. Willis Towers Watson hosted their annual football match where professionals within the Insolvency and Receivership industry had the opportunity to play on the premier league pitch at Crystal Palace football club. The game was held on the 17th May and kicked off at 12:45pm. With Team Purple being managed by Adam Humphreys and Team White being managed by Ronnie Walters, the teams appeared to be fairly evenly matched. However, the final score was 5 – 3 to Team White. “Although it was a friendly game, competitiveness was shown throughout and, watching as the audience, it felt extremely tense.” Clearway sponsored the ‘man of the match’ prize but, due to two players in particular standing out, it became ‘men of the match’; namely Chris Allen from Smith & Williamson and Marcus Bassett from Duff & Phelps. Chris won a signed Crystal Palace football and Marcus won 2 tickets for England vs Nigeria at Wembley. Congratulations and well done to everyone involved. A block of flats, in south London, required immediate attention when water started leaking from the roof into a tenant’s property. Unusually the property had a roof garden, and when it rained water-laid in soil would sit above the flats and it started to leak through. The original plan was to move the plants and soil from one side to the other in order to find the leak. However, this would not stop if it were to happen again therefore the plan was changed to remove the whole garden. This would turn out to be a massive task. Cherry pickers and scaffolding were required to carry out the works. It took 14 men, 12 hours a day, 5 days, 8 floors up, to remove 171 tons of earth. The soil and vegetation was handled one bucket at a time, passed down a rubbish chute to the ground floor and then loaded on the trucks to be disposed of. Anti-social behaviour is a common problem for property managers and business owners and takes many forms including the after effects of joy-riders. Empty car parks are frequently occupied by gangs of ‘boy racers’ who will find any available space to prove their prowess and leave their mark with revving engines and screeching tyres. This is pure anti-social behaviour but it can easily be avoided. The wilful defacing of a private car park is criminal damage that could lead to prosecution – but only if the offenders are caught, and there is a solution available. Clearway’s high-spec temporary CCTV towers are more than a powerful visual deterrent; they are a state-of-the-art technology solution to an irritating and costly problem. The CCTV towers operate 24/7 and are fully power-independent, recording and storing remotely all triggered events. Engineered to remain outside in all conditions the Clearway temporary CCTV tower can be left unattended for long periods of time, providing security, high deterrent value and peace of mind. Experts have warned; buyers of new build properties are at risk to Japanese knotweed due to a legal loophole. Property owners wishing to sell their property are required to complete a TA6 property form, which declares whether the property or garden is, or has been, affected by the Japanese knotweed. In 2013, this form was changed and now means developers and builders are not obliged to complete it. Japanese knotweed can grow more than 1m in height in three weeks and the elaborate root system can go down 3m and out 7m. Japanese knotweed can crack tarmac, block drains, undermine foundations and invade homes causing major damage to buildings. It’s presence can cut a property’s value by 20% and can even prevent mortgage lenders approving a loan. The legal loophole can be extremely expensive for new home buyers. A couple bought a luxury new home from a property developer before finding Japanese knotweed. The pair have now been forced to spend around £5,000 to treat the plant but have said it was “not good enough” that the developer didn’t warn them. Japanese knotweed, which thrives in hot weather, is responsible for £170 million worth of home repairs every year in the UK. It is also an offence to allow Japanese knotweed to spread across neighbouring land. As experts in treating Japanese knotweed we recommend it being treated during early and late Summer with the dead stems (above ground growth) removed in the Winter. However, standard advice is to treat Japanese knotweed as soon as it is identified. We have now published our new full services brochure, available in printed format and as a downloadable PDF by clicking below: Our brochure includes everything you need to know about our full range of products and services including the latest addition to our security products; our NEW, fully independent, temporary CCTV tower. The Clearway brand has continued to evolve and is recognised as representing reliability, quality and great customer service, which is why we continue to lead in the UK’s vacant property security market. Clearway has attended some of the worst areas for fly-tipping whilst working for KCC. Last year, in Kent, there were around 19,938 incidents of fly-tipping, costing the taxpayer a total of £1,308,284. Medway was noted as being one of the worst areas for fly-tipping in the South East. It had the highest number of reported incidents (3,637 cases) which cost the council £252,327. These figures only for Kent County Council, not nationwide, however they are extremely high considering they do not account for private and farmland where the cost is met by the landowner. New powers to crackdown on illegal fly-tipping are soon going change this by providing local authorities with the option to fine those whose waste ends up fly-tipped rather than having to pursue them through the courts. Currently councils can only prosecute householders in court but a new fixed penalty notice would be less costly to enforce. Clearway Environmental Services Limited have been clearing both domestic and commercial waste since 1991 and have noticed the number of fly-tipping incidents rapidly increase over the years. Our waste clearance services support local councils, farmers and other land owners in removing the waste, sometimes a same day response team can be provided. Warning to all Property Owners: Your empty property is at risk! Make sure you keep your vacant properties protected over the holidays as Christmas is a prime time for squatters and metal thieves to make their move. As the cost of metal rises so do cases of theft. Typically, burglaries and theft increase by 13% during December. Metal theft is costing the UK around £770 million a year. Don’t get wrapped up with all the Christmas activities; make sure you have everything in place for the Christmas holidays. With our range of property security services, including steel screens and doors, temporary monitored alarms, CCTV plus monitoring and call-out services, you to sit back and relax. Three men were caught on camera dumping a fridge, an old ironing board and many other items on the side of a country lane. Ms Gordon, a lady who was driving along the country lane, was forced to stop because a van was blocking her way whilst three men had stopped to fly-tip. As she stopped the car, one man aggressively approached her demanding; “what do you want?” She replied; “What do you think you’re doing? It’s illegal dumping rubbish.“ Another man noticed her dash-cam and insisted she give it to him. “It’s fine, what’s that? Is that a camera? Give me your camera!” Ms Gordon reversed at speed to escape the men, one of whom jumped onto her car bonnet. She swerved, causing the man to fall off, and continued to reverse until the men were out of sight. On YouTube, where Ms Gordon posted the video, she wrote: “This happened a year ago. Only putting it online now it now because I was scared to upload it before.” Fly-tipping is a major issue across the country, with almost half a million incidents reported between 2016 and 2017. Fortunately, the above encounter is rare, but the lengths some people will go to in order to illegally dump rubbish is a growing concern. A request for us to provide a drug-detection dog unit demonstrates how no two days are the same at Clearway. Our client, a college, requested the sniffer dog to scout-out both the site and pupils in search of illegal substances and, in a single six-hour session, the dog found 15 separate indications of drugs on site. Vacant properties are not confined only to the UK and the many problems associated with them are the same everywhere. Illegal occupation, vandalism, theft and willful damage occur everywhere the temptation of an empty property exists. As the number of vacant properties continues to grow, so does Clearway Services and the news of our range of excellent services also spreads far and wide. Whilst Clearway currently only operates in the UK, our monthly emailed newsletters have been opened and read, during 2017, in more than 60 countries from China to Mexico and Norway to South Africa. St Mary’s church, Shrewsbury, was hit by thieves twice in the space of 4 months during 2017. First in July, when 250ft² of lead was stolen from the roof of the church and again in September, 150ft². The historic fabric of the building was damaged and, in both cases, Battlesfield Cafe had to close while the building was secured. Jessica Robertson, spokeswoman for the Churches Conservation Trust, said: “The Churches Conservation Trust is the national charity protecting historic churches at risk.” “The cost of replacing the lead and repairing the damage to the historic fabric of the building will run into tens of thousands of pounds for our charity. In addition, on both occasions, the popular Battlefield Café was forced to close while the building was secured.” This is the eighth church in the Trust’s care which has been hit in 2017 alone. Jessica said: “At present, we need to raise more than £1 million to re-cover all of the roofs stripped of lead in our estate.” Metal theft is recognised as being a serious problem in the UK and it’s increasing every year. The former National Metal Theft Taskforce has warned that a current lack of expertise is fuelling an increase in offending and problems linked to metal theft. If the cost of metals continues to rise or stays the same there could be an ‘explosion’ in metal theft and associated problems. Clearway Services can help prevent these issues by providing solutions such as Temporary CCTV, Monitored Alarms, Property Inspections and more. Temporary CCTV solutions include a Mobile CCTV unit or self-powered Tower. Both provide an excellent visual deterrent and are ideal for vulnerable and remote locations. Clearway work with intu to protect Lakeside. intu, Lakeside is undergoing some construction work that will host Nickelodeon’s first UK shopping centre attraction. intu is to build a 175,000 sq ft leisure extension which will not only include Nickelodeon-themed attraction but one of Hollywood Bowl’s biggest tenpin bowling venues. Whilst the construction is undergoing, intu required outdoor CCTV covering a large area. Clearway’s mobile CCTV unit, was an ideal solution as its powerful pan/tilt/zoom camera is height adjustable up to 6m from the top of the unit and can be controlled remotely from a PC or mobile device. Our mobile CCTV unit has been at Lakeside since the 8th of September. Clearway bikes finally find a home! The Calabar School in Jamaica is an all boys school, that ensures the best possible outcome for all their students through efficient use of resources. The core of garnering support for the high school is the Calabar Alumni and Friends Association UK, a not-for-profit organisation, set up by ex students of the school. The Alumni and Friends Association’s mission is to “Mould Boys into Good Men and Responsible Citizens.” Clearway Services has donated over 30 bikes to the school to help the young boys. The bikes will be a great asset to the boys encouraging sports as well as their own projects to work on. Sports plays an important part in the life of the school, so the bikes are extremely valuable. Kevin Palmer, an ex student of Calabar High School and a representative of the Alumni and friends charity, had a few kind words to say about Clearway: “Many thanks to Clearway Services for supporting our charity by donating a range of different bikes, this will help the students massively by giving them a sense of responsibility and independence. The Calabar School will benefit from the bikes as will the local community, farmers and young entrepreneurs. The bikes will be used for transport to and from school, leisure and training.” The bikes have been shipped to Jamaica so will arrive in a few weeks. We look forward to receiving an update on how the bikes have helped the locals. Summer is finally here and school holidays are upon us but what does that mean for schools? The school will be empty for six to eight weeks It will be vulnerable to unwanted intruders and squatters Unprotected against thieves stealing computer equipment Unguarded from vandals breaking in and covering the school corridors in graffiti This could cause the school not to re-open on time and, just like any empty property, it needs to be protected. Clearway offers a range of different services to help keep your school protected against unwanted visitors. Monitored Alarm Clearway’s monitored alarm is a fully self-contained, portable alarm system that can be fitted, commissioned, verified and working to protect your property within 20 minutes. The alarm can be configured to detect movement, smoke, fire, water, gas and broken glass and, upon detection, send relevant information to the monitoring center or client. Mobile CCTV Unit Clearway’s mobile CCTV unit is a natural visual deterrent as well monitor vulnerable situations. The mobile CCTV unit can be deployed and rapidly set-up in any sort of environment and get to work almost immediately. Its features include mast-mounted dome camera has rapid-action, 360 degree viewing angle and a high-power optical zoom lens. Security Guards Clearway’s manned guarding service provides the physical presence of security guards to provide permanent, visible protection for your property. Security guards are a short-term solution, providing protection against unwanted intruders whilst allowing the smooth flow of legitimate personnel. The Clearway brand has continued to evolve and is recognised as being reliable and trustworthy, with extremely high value placed on both quality and customer service. Having now finally received approval to attach signage to our headquarters building in Dartford, Kent, we have erected a seven-meter triangular sign facing the Dartford Crossing. Apparently the sign can be seen from space. Clearway is firmly established as a premier nationwide provider of vacant property security, property services and temporary CCTV for local authorities, care homes, pub companies, housing associations, the Metropolitan Police and many more. Next time you’re driving through Dartford, come and be dazzled by our new sign! What would be the perfect building for a rave? A vacant one. There was talk, on social media, of a rave potentially going to happen in Brighton. The perfect venue; a large, empty, commercial building and full of opportunity. The building in which the rave was planned to take place was vacant and due to be sold for conversion into flats. There were already regular security patrols around the building and smashed glass from some broken windows was noticed by the security guard, suggesting that one of the rave organisers had been inside the property ensuring it was a suitable venue. Clearway was immediately called to secure all the vulnerable openings of the basement and to secure with chains and padlocks the pedestrian gates which lead down to the basement. Clearway’s high-tech Mobile CCTV Van unit was hired for three weekends. The CCTV van was positioned on the south side of the building, being used mostly as a visual deterrent. The Pan-Tilt-Zoom camera was set on ‘guard tour’ to show it was in use and working. Security Guards with two dog units were also required to be on site all weekend. Needless to say, the rave didn’t happen and the building remained secure and undamaged. Ocado’s £250million depot in Dartford, Kent, was invaded by more than a dozen caravans, helping themselves to showering facilities, towels, food and drink. Using a van, they pulled away a giant boulder that was blocking the warehouse entrance to gain access. The intruders locked themselves in and turned away more than 40 staff members / contractors for work, meaning lots of people being sent home without getting paid. This soon ended, riot police arrived onto the site. Bolt cutters were used to get in before ordering all the intruders to leave. One man allegedly picked up a chain and, in response, officers with riot shields slammed him to the ground. Ocado did not comment on the invasion. Photo courtesy of News Group Newspapers Limited. The police often deal with difficult crime and trauma scenes. They can include murder, suicide, undiscovered deaths, accidents and terrorism which usually leave behind: human blood, bodily fluids & tissue, chemicals and infestations from maggots and flies. Dangerous items, such as weapons and drug-related paraphernalia, are frequently left at the scene to clear too. These scenes can be quite gruesome and gory requiring commitment, dedication and sensitivity towards the situation. Specialists skills and knowledge are required for this type of work which is why Clearway has provided crime and trauma scene clean-ups for the Met’ Police since 2009. Our crime scene and trauma teams are trained to secure crime scenes and fully licensed by the Environment Agency. No two jobs are the same and our teams are constantly faced with different challenges. We work within strict guidelines ensuring all potential risks to human health are minimised. Whilst the rumours that Japanese knotweed can grow through solid concrete foundations or break into underground water pipes are untrue, it is an extremely aggressive plant, growing at the rate of 1 meter every three weeks during its growing season. Where the plant finds its way into existing cracks in concrete, pathways and walls or it finds its way into basements, the damage can be extensive and it can even undermine building foundations, hence why mortgage lenders are extremely wary once the presence of the plant is confirmed. The ability of Japanese knotweed to reproduce so aggressively is partly because the tiniest piece stem can efficiently reproduce (a fingernail-sized fragment is enough to grow into a whole new plant) and partly because of its ability to extend underground so it’s extremely difficult to know where the plant will pop-up next. The roots can grow up to 3 metres downwards and up to 7 metres across. In Japan, the plant is kept under control by the presence of insects or other plants but these are not [yet] present in the UK. Prime growing time for Japanese knotweed is spring to summer. Early identification and treatment is the best course of action. It can almost impossible to dig-out Japanese knotweed because the bulbs are buried deep in the earth. It’s also illegal to remove Japanese knotweed waste from a site. As such, industrial-strength herbicide treatment is the only effective eradication method but even this can take 3-4 years of chemical treatments applied 3-4 times per year. Smaller plants can be sprayed but larger plants will require injecting individually. The strength of chemical required can only be purchased by a qualified treatment specialist such as Clearway. Alternatively, you can cut the stems, peel, boil and serve them up like Rhubarb! For the 2015 / 2016 year, local authorities dealt with 936 thousand fly-tipping incidents, a 4% increase over 2014 / 2015 and is continuing to rise. Residence could potentially face prosecution after fly tipping outside Northwich recycling centre following the Council’s decision to close the site on Wednesdays and Thursdays. Cheshire West and Chester Council cut opening hours for a number of its Household Waste Recycling Centres, including the Northwich site. The changes were made to ‘ensure sites are open when they are most needed whilst operating as cost effectively as possible’. Frustrated residents have resorted to dumping their waste outside the entrance but automatic number plate recognition technology is monitoring vehicles entering every site. Enfield is worst borough for fly-tipping According to statistics from the Department of Environment, Food and Rural Affairs there were 70,930 fly-tipping cases in Enfield up to March 2016, equivalent to 22 per cent of its population. Haringey came next with 34,975 and then Newham with 32,718. A spokesperson for Enfield Council, said: “The figures for the borough were so high because they include all dumped waste and not just fly-tips reported by residents. He continued: “What the figures from Defra do show is that Enfield Council is the most active council in the country when it comes to dealing with fly tippers and keeping our streets clean. We aim to clear all reported fly tips within four hours of them reported.” Fly-tipping clean-up costs £50m as cases in England rise for third year in a row According to DEFRA in March 2017, there were 936,090 cases of fly-tipping in 2015/2016, an increase of 4% on the previous years. Councils across the country have cut waste collection services leaving some people to dump their waste illegally costing an estimated £17 million to clean-up. Rubbish dumped ranges from household waste, white goods and vehicle parts to large scale incidents including asbestos, tyre mountains and chemical drums, oil or fuel. Terrace Guest House, a former hotel in Royal Terrace, Essex was taken-over by squatters whilst the building was being refurbished. They immediately put up signs within the property claiming they had the right to live there. The squatters were accused of bringing crime and antisocial behaviour to the area before finally being evicted. The first group of squatters left after the electricity was turned-off but a second group moved in a week later. A resident said “There has been noise, rubbish and intimidating behaviour from these people. Another said “It has been 13 weeks of hell” before the courts issued an order to evict the squatters. Once vacant we secured the property using our steel screens and steel doors which provide a highly visible deterrent and are perforated to provide light and ventilation. In January 2017, we launched our brand new, refreshed website. With a great focus on helping our customers understand how we can help them, our new website now provides the full range of services covering vacant property security, property services and temporary CCTV solutions. So what’s new? The new website is now much clearer, easier to navigate and is fully compatible across desktop, tablet and mobile devices. The content has been completely rewritten throughout to make it easier and quicker for you to find the specific information you need. We’ve also included videos on some of the services we provide to give you a better idea of exactly what we do and how we do it. For those looking for a new career we have a new page; ‘Careers with Clearway’ For quick contact we have a new feature on the home page – a ‘how can we help you?’ form which provides a call- back service for a time that is convenient for us to call you back. Our newsletter is becoming ever-more popular too, with over 8000 subscribers currently! We have worked hard to develop our new website in a way that makes it as easy as possible for you to find how we can make life easier for you. Relax… we’ve got it covered. When an elderly pedestrian was struck by a speeding car at a sat of lights, one of our teams was quick to rush to his aid and provide assistance until the emergency services arrived. The speeding car overtook at the traffic lights and hit the pedestrian with such force, he was thrown into the air and sustained a serious head on impact. The victim was bleeding profusely and our operative helped to stem the bleeding, providing reassurance as the gentleman regained consciousness. Clearway is extremely proud of its staff and especially to this team for their quick and selfless action which undoubtedly helped to save the elderly pedestrian’s life. All in a day’s work. We have no further information as to the well-being of the injured gentleman and hope the injury sustained hasn’t caused lasting serious damage.